Secret Military Tunnels Under The U.S? Conspiracy theories abound these days about an elaborate network of secret tunnels created by the United States government that some reports say run from the new Denver International Airport eastward to possibly Washington D. C. and south to Florida. The story about the tunnels and possible rooms under Denver International Airport were recently publicized by Jesse Ventura in his popular Conspiracy Theory television show. Ventura didn’t exactly prove such tunnels existed, but he produced images of entrances to tunnels, military guards at the gate, and talked to people who swore such tunnels and rooms were in existence. Denver’s new airport was built in 1995 over 53 square miles of barren territory far outside the city. During construction, it was noted that deep excavations appeared to be going on at this site. Controversial geologist and conspiracy theorist Paul Schneider, who died under mysterious circumstances in 1996, claimed that nearly 130 deep underground facilities existed under United States soil, nearly all manufactured by the government. He claimed that he personally worked on 13 of them. Schneider was a major contributor to a web site appropriately titled Undergrounded Bases and Tunnels. The site offers various images of giant multi-million dollar machines designed to bore deep underground tunnels through solid rock. He wrote that “most tunneling activity is under military installations and all information is highly restricted.” He said people who have worked on these installations have surfaced from time to time to talk about tunnels and other facilities under places like Area 51, the Northrop facility in Antelope Valley, California, and the Lockheed installation near Edwards, California. Schneider wrote that the tunneling is part of a $1.25 trillion yearly “black budget” operation. He said work on 129 bases has been going on since the days of World War II and possibly even longer. “These bases are basically large cities underground, connected by high-speed magneto-leviton trains that have speeds up to Mach 2. “The average depth of these bases is over a mile. . . They all between 2.66 and 4.25 cubic miles in size,” Schneider wrote. William Hamilton III, in an Internet report titled Dulce and Other Underground Bases and Tunnels, writes about a strange story in the August 7, 1989 edition of U.S. News and World Report. It reveals a secret plan to carry on government in the event of disaster. Called Continuity of Government, or COG, it involved creation of the Defense Mobilization Planning Systems Agency. It included construction of an underground network of tunnels and bases. The story told of 50 special underground command post bunkers located in various regions of the country, each linked by satellite or ground wave relays. In the event of nuclear attack or some other terrible catastrophic event, the President and special teams equipped with war plans, military codes and other essential data would accompany potential presidential successors into these posts. Deep underground construction sponsored by the U. S. Air Force with the help of the RAND Corporation began as early as 1958. Huge boring machines with large diameter disc-grinders were designed and used to construct the tunnels allegedly linking the various facilities. It is rumored that the machines were, and are, capable of boring up to seven miles of tunnel in a single day, melting the rock and packing it as lining into the walls, thus assuring against cave-ins. 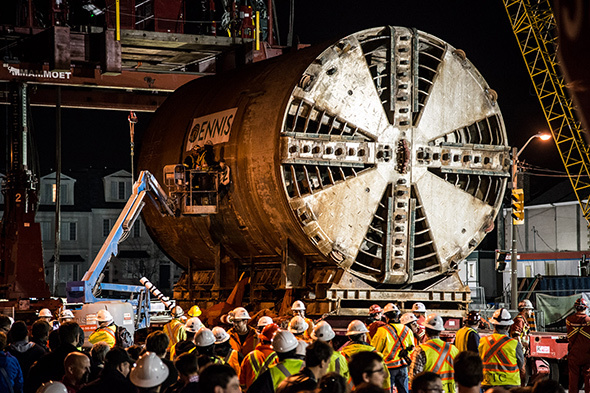 With machines like this, the story is told that the United States government now has tunnels linking the East and West coasts and all of the secret underground bases in between.